If you followed one of the comprehensive install guides or you performed a custom installation and included the monitoring.yaml file in your installation, all of the observability features are already installed and you can skip down to the Create Elasticsearch Indices section. If you have not yet installed any observability plugins, continue to the next sections to do so now. Tip: Hit CTRL+C to exit watch mode. Accessing Metrics for more information about metrics in Knative. kubectl label nodes --all beta.kubernetes.io/fluentd-ds-ready="true"
When the installation is complete and all the resources are running, you can continue to the next section and begin creating your Elasticsearch indices. To visualize logs with Kibana, you need to set which Elasticsearch indices to explore. This command starts a local proxy of Kibana on port 8001. For security reasons, the Kibana UI is exposed only within the cluster. Navigate to the Kibana UI. It might take a couple of minutes for the proxy to work. Within the “Configure an index pattern” page, enter logstash-* to Index pattern and select @timestamp from Time Filter field name and click on Create button. See Accessing Logs for more information about logs in Knative. Choose a container image that meets the Fluentd image requirements. For example, you can use a public image. Or you can create a custom one and upload the image to a container registry which your cluster has read access to. Your Knative Serving component is not hosted on a Google Cloud Platform (GCP) based cluster. You want to send logs to another GCP project. Follow the instructions in “Setting up a logging plugin” to configure the stackdriver components settings. 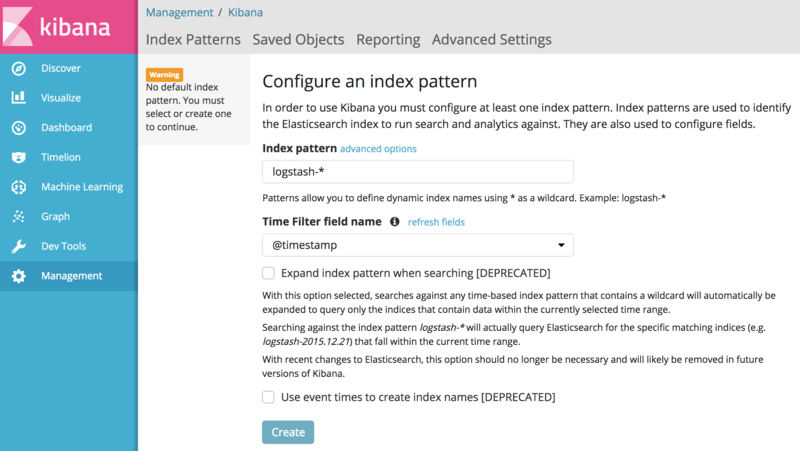 Open Kibana UI as described in Create Elasticsearch Indices section. Select Create Index Pattern button on top left of the page. Enter zipkin* to Index pattern and select timestamp_millis from Time Filter field name and click on Create button. Visit Accessing Traces for more information on end to end traces. Except as otherwise noted, the content of this page is licensed under the Creative Commons Attribution 4.0 License, and code samples are licensed under the Apache 2.0 License.